Delayed Harvest and Extended Storage of ‘Gloria’ Peaches. ‘Gloria’ can hang on the tree for 5-7 days after they reach commercial maturity. Hanging longer than 7 days reduces their storage life significantly and is not recommended. The fruit will soften on the tree if left for 5-7 days after reaching commercial maturity, but only slowly. 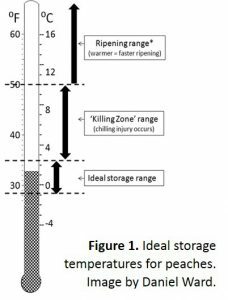 Please note that the storage of ‘Gloria’ peaches, just like any other peaches, should be near 0 °C (32 °F) (Figure 1). Storage temperatures much greater than that may cause mealiness and browning around the pit, especially during extended storage.